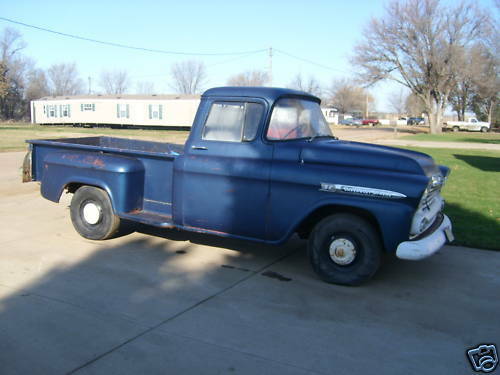 This truck is no longer available for sale as we have started a full restoration from the chassis up. It will be Chevrolet Larkspur Blue and India Ivory when finished. Price completed will be c£12000 - £15000 depending on how much is spent on it. 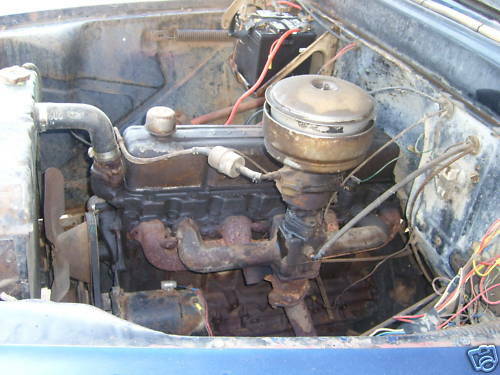 It is being restored to full standard 1958 condition. It's almost done, will be in for MOT Sat 19th, watch out for updated pics. 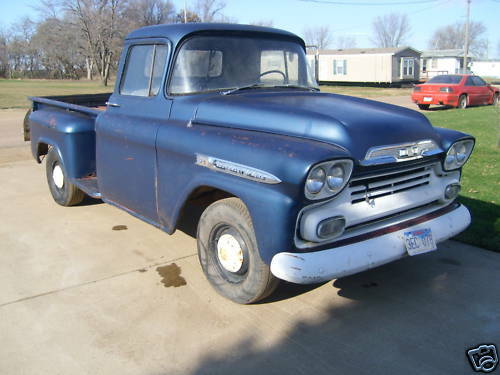 This classic 1958 Chevrolet Apache 3200 truck will be arriving late February. 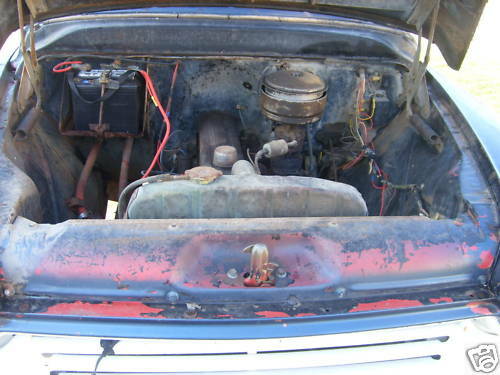 This is in need of restoration, but runs and drives well with it's original 6 cyl engine and 3 speed manual gearbox. It has just had a new brake master cylinder, but at this point we don't know exactly what it will need to make it roadworthy in the UK. 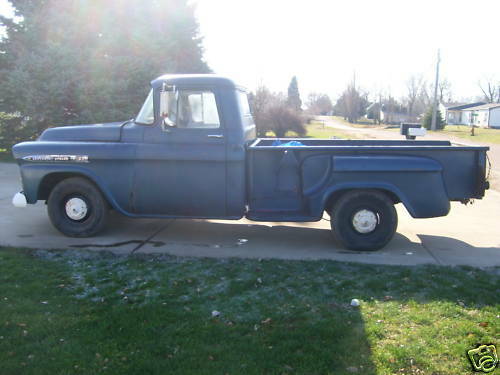 We can make this truck available to you at low cost in "as imported" condition for you to do all the work yourself. This can be the best way if you want to customise it, as there's little point in us re-newing parts like brakes, wheel bearings, etc (if it needs these!) if you are going to fit modern suspension, airbags, etc, as that would just be money wasted. Get in touch if you want this as imported, because shortly after arrival, we will inspect it and order standard parts as needed. We can then offer it for sale in "on the road" condition with registration, MOT and road tax, though this will obviously be more expensive than you doing it all yourself. 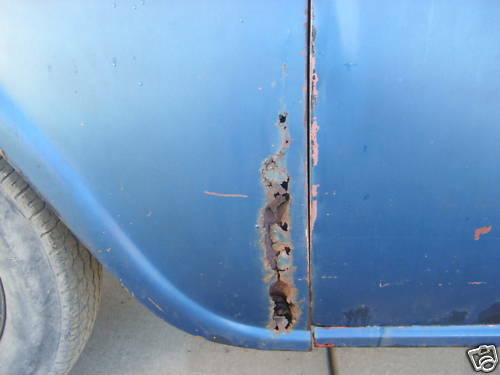 We can then go a stage further and do the bodywork and paint, but by this stage we are nearing a full restoration, at least to good driver condition, or further yet to show condition. The price obviously goes higher at each stage. "As imported" should be available for about £5500, which is about as cheap as you could import one of these yourself. Please bear in mind when looking at trucks for sale in the States, that you have to add shipping, which can cost from £2000 upwards, depending on where the truck is located. You then need to add 22% import duty (that goes on the price of the truck AND shipping), then you have to total that lot up and add 17.5% VAT. You will then have £200 to £400 costs in the UK to have the paperwork done, and maybe have it decanted from a container. Yep, suddenly your cheap $3000 dollar truck is now oweing you somewhere around £6000, and it's still lying at the docks in the UK, you still have to get it home, and you still haven't found out what it's REAL condition is!! We take all those problems away for you. 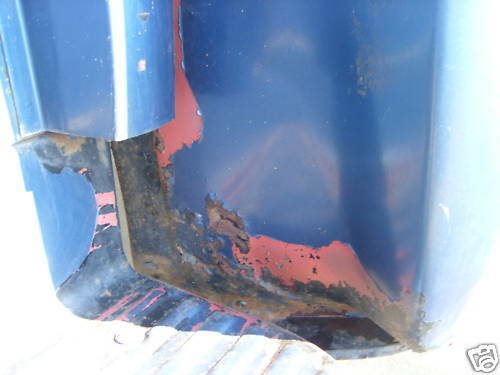 The panels shown with rust are the areas where these trucks always need work, i.e. 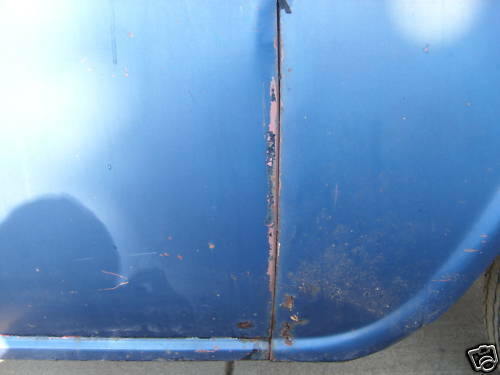 bottom trailing edges of front wings, steps, lower cab rear corners. All of these patch panels are readily available in the UK. See our links pages for a reputable supplier. I've had a quick look around and a short drive in the industrial estate and it all works! 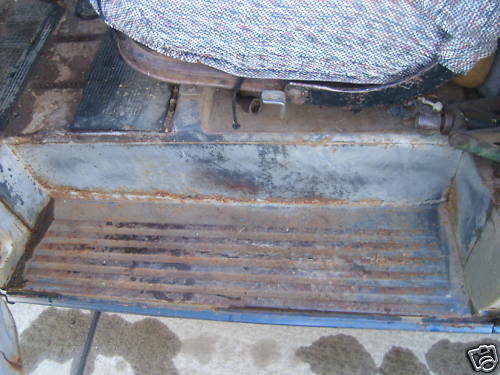 It starts, idles and drives very well, all 4 gears and reverse work no problem, clutch is great, brakes work fine, even the park brake though it is a bit weak probably needing adjusted. Haven't had the hubs off, but it steers and stops well so probably nothing much needing done. 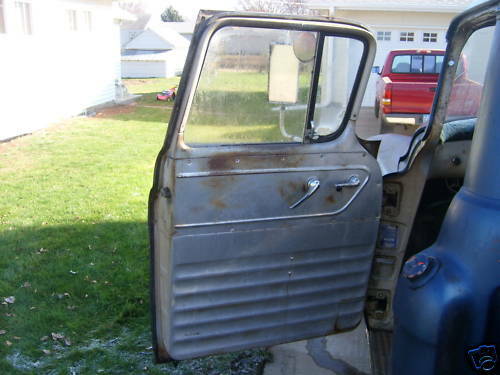 A couple of the lights don't work (they will before it's sold) and the wipers don't work. So, for an MOT it will need a quick look inside the hubs, adjust the brakes, check and sort the lights, wipers, etc. It needs a set of tyres, no point in me puting standard tyres on if you are going to fit wider wheels. Windscreen has a small chip, will depend on your MOT man, new screens avaialble in the UK for £170. 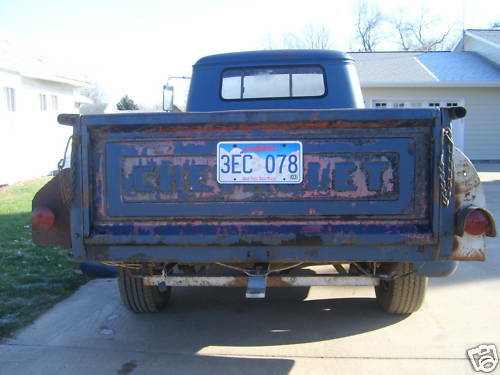 Rust wise, normal Chevy pickup areas, but nowhere near as bad as I imagined, front wings are worst, you can see that in the pics. 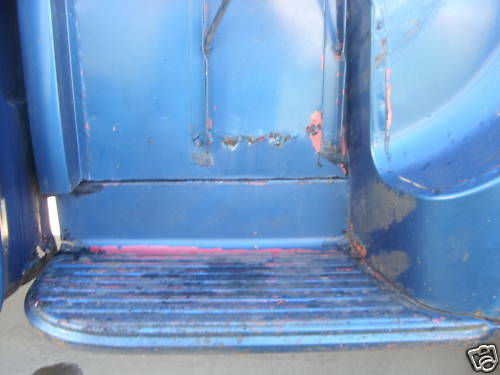 None of the body rust is an MOT problem, all chassis and floor areas are fine. 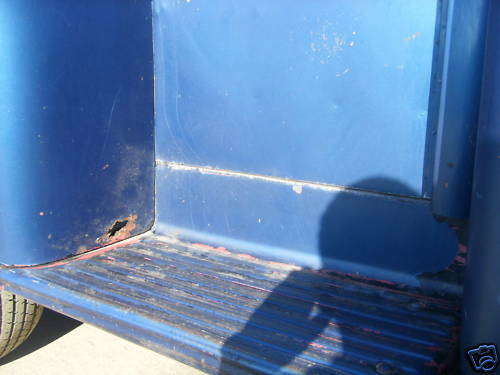 Pickup body is loose, will require a bit of welding to front panel, then secured properly with some new bolts. Bed floor needs replaced. 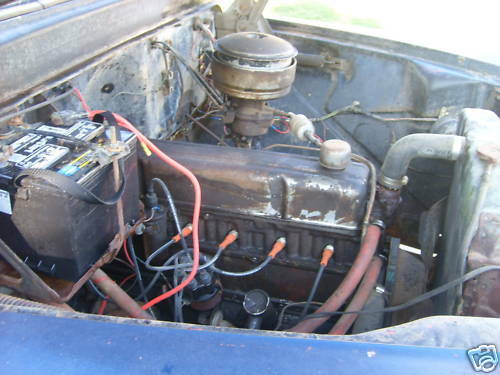 All in all, if you want a rat rod it wont cost much to put on the road, so, if you want to do the work yourself you can take it as is and be first name on the V5. Price is £5500. 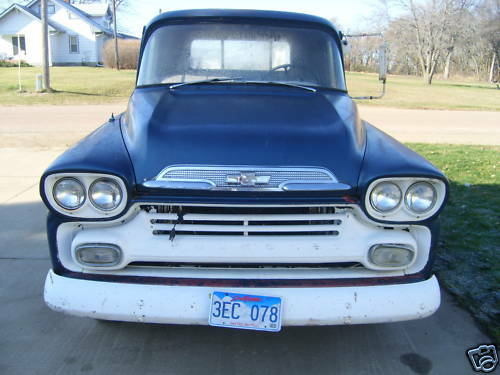 With a full MOT, price will be £6500, a good price for an up and running and on the road '50s Chevy.